Ancestors of Daniel Maguire Jr.
Daniel Maguire, 75, of Sabattus, died Thursday morning at the home of his daughter, Mrs. Florence Hammond at Sabattus. Mr. Maguire had been in failing health some time. 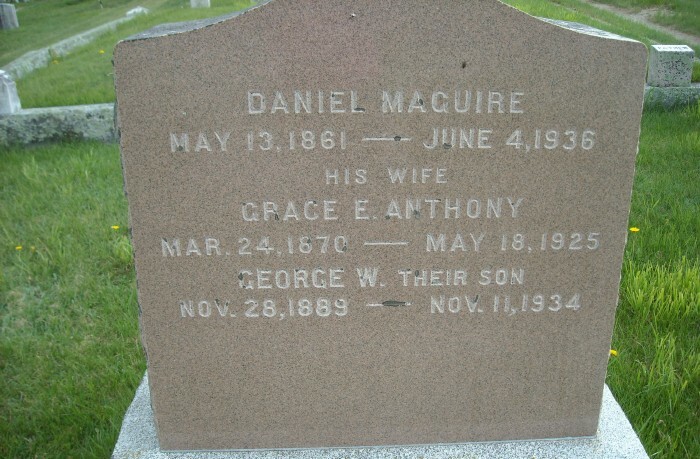 He was born at North New Portland, May 13, 1861, son of Mr. and Mrs. Daniel Maguire. For some time, Mr. Maguire was employed as a railroad fireman, and later by the Turner Center Creamery. He had made his home at Sabattus about a year. Surviving are two daughters, Mrs. Florence Hammond and Mrs. Emma Bradford of Sabattus; three sons, Earl of Leominster, Mass., Carroll of Auburn and Percy Maguire of Lewiston; and five grandchildren. In Sabattus, June 4, Daniel Maguire, age 75. Funeral from the Memory Chapel of Dillingham & Son, Saturday, June 6, at 3 p.m. D.S.T. Interment at Leeds Center. Funeral services for Daniel Maguire who died recently at Sabattus, were held Saturday afternoon from the Memoril chapel of Dillingham and Son, Auburn. Rev. Edward W. Babcock of the Court St. United Baptist church officiated, and interment was at Leeds Center. • He worked as a R.R. fireman and farmer. • He appeared on the census in 1910 in Leeds, Androscoggin County, Maine. He was head of household and property owner. • He was buried at Leeds Center Cemetery in Leeds, Androscoggin County, Maine.